Warner Bros. has just unveiled the first trailer for Steven Spielberg's big screen adaptation of Ready Player One and it's a nostalgic geek fest full of pop culture easter eggs from the 1980s. The footage from the trailer reveals the stacks where Parzival lives in Columbus, Ohio in the year 2045 and then shows him get into his dilapidated van to plug in his VR rig to escape into the OASIS. 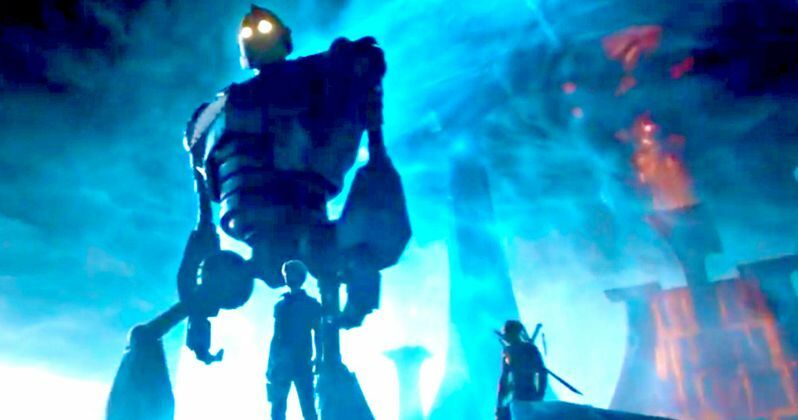 A picture from within the Parzival's trailer was released earlier this week and there were a ton of easter eggs hidden within the picture, but the picture pales in comparison to the Ready Player One trailer. The trailer comes to us via Warner Bros. U.K.'s YouTube channel and it demands repeated viewings to see what you might have missed. For starters, when Parzival first gets in his van and ready to suit into the OASIS, he pulls some kind of hologram apparatus from a hook on the wall. But it's no ordinary hook, it's actually an old Atari joystick with the orange buttons giving it away. Parzival narrates the trailer and says that he wishes that he were born in the 80s because that's where all of his heroes are from, which should give you an indication of what kind of pop culture easter eggs will be found. Next up, people are dancing while floating in the air and then the trailer flashes to the Iron Giant walking across an alien landscape with what appears to be a tiny Teenage Mutant Ninja Turtle, specifically Leonardo by the look of two katana swords held on his back, or maybe it's Deadpool? The Iron Giant looks massive, but he, like the rest of the easter eggs is shown ever so briefly within the trailer. There's even a brief flash of the Statue of Liberty from Ghostbusters. One has to wonder how much the Ready Player One production had to pay to pull off all of the licensing. The next easter egg that we see is the DeLorean DMC-12 from 1985's Back to the Future doing a burn out on some futuristic roundabout. Next there is an intense battle scene where somebody is riding a mechanical scorpion fires a blaster and obliterates Freddy Krueger. Yes, Freddy makes an appearance in Ready Player One too. Freddy is seen getting ready to use his glove mid leap, but is blown up instead as the camera pans to Duke Nukem. As Rush's classic anthem "Tom Sawyer" plays you see a bunch of corporate OASIS easter egg hunters strapping into various vehicles. Then you see 80s monster truck legend, Bigfoot crushing the cars and just being all around awesome. As far as vehicles are concerned, there's flashes of the Mystery Mobile from Scooby Doo along with Tom Cruise's stock car from Days of Thunder, A Tron Light Cycle, and Akira's motorcycle as well. The trailer moves pretty fast and is plenty intense, almost teasing and taunting the viewer to search for every last pop culture reference that they can find. The trailer also does a real good job of getting you hyped to see the movie, which it should do, but there are just so many cool things to look at and find within the trailer. Steven Spielberg's Ready Player One doesn't hit theaters until March 30th, 2018, so check out the trailer below and see how many pop culture easter eggs you can find within the OASIS.